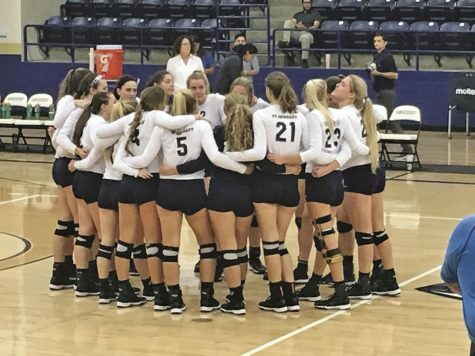 SEU volleyball team comes together after conference win. 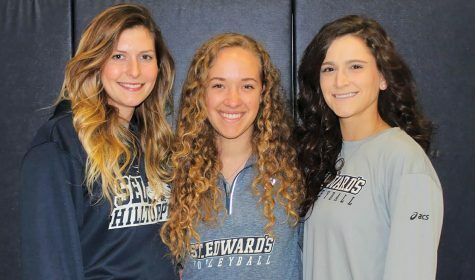 With preseason under their belt, the St. Edward’s volleyball team hosted the Newman University Jets to kick off the Heartland conference play on Thursday, Sept. 27. SEU dominated their opponents by winning the first two sets by a comfortable 10 point margin. Senior middle hitter Mikayla Parker attributes the early lead to an excellent team excursion and staying focused on the task at hand. With a successful initial play, Newman gained their first win during the third set, raising their score to 24-26. As the fourth set began, Newman continued to control the pace of the game. However, SEU instantly responded with precision and focus. 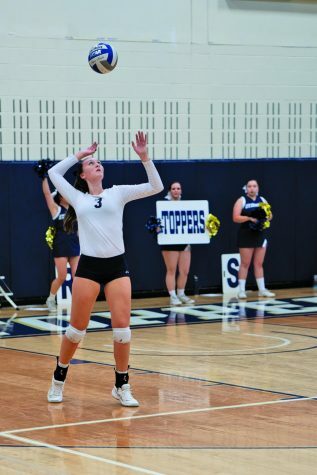 Sophomore outside hitter Maddi Miksch commented on the late fourth set win and said that defense played a crucial role in the team’s ascendancy. 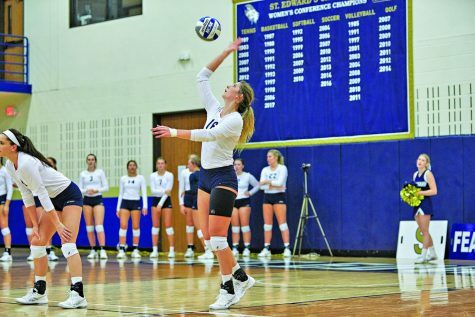 “We had several big blocks and I think that just brought back all of our energy, it was really great for those blocks to come in, especially because we are usually a big blocking team and we hadn’t had any,” said Miksch. SEU ended up winning the set 25-19. 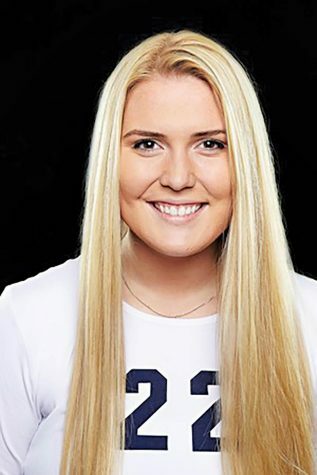 With a high of 13 kills from Miksch, 7 blocks from Parker and 22 assists from senior setter Julia Hartley the team gained an overall 3-1 win over Newman. When asked how the team prepared for their first conference matchup, Miksch said that they honed in on training players’ speed. “We focused on outsides/right sides, worked a lot online, transitioning fast and just drilling them down the line and it proved to be productive tonight,” said Miksch. Miksch says that staying positive and emphasizing collaborativeness really helped the team out. 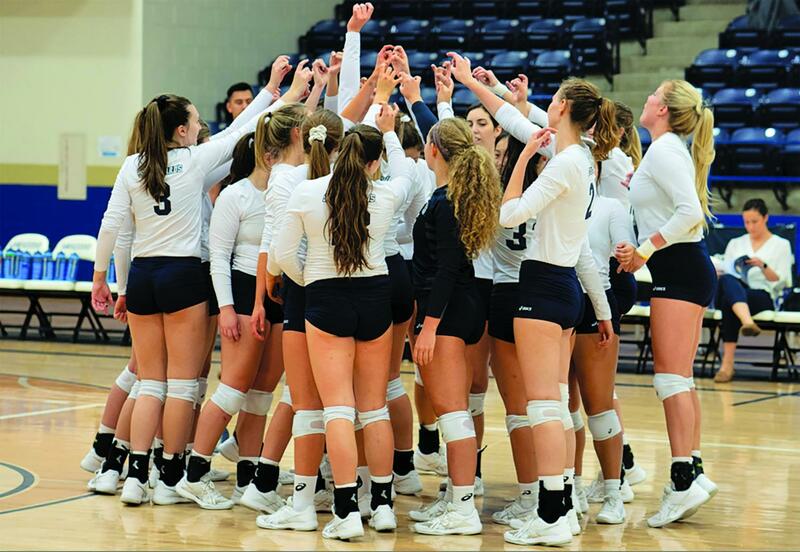 “A positive that I saw from my team was that when we were down during some of the points and matches, we found a way to come together and start playing as a team and it was great to feel the energy between all of us,” said Miksch. With SEU’s starting 1-0 conference record, Parker marks the win as a good way to begin the season. “It puts us in a great position and gives us a great momentum moving forward,” said Parker. The team hopes to keep the energy going as they prepare to travel and faceoff against Lubbock Christian at noon on Oct. 2.